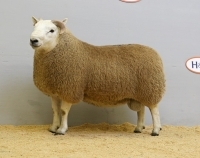 The Charollais breed of sheep is a major player in the UK prime lamb sector. A terminal sire renowned for its quality carcase, easy lambing and flexible marketing. The Cheviot Hills, from which this breed of sheep gets its name, form the border line between England and Scotland. The Dorper Sheep Society Ltd.
Dorper sheep are hardy, prolific milkers that shed their wool, can breed all year round, producing fast growing lambs and succulent meat.